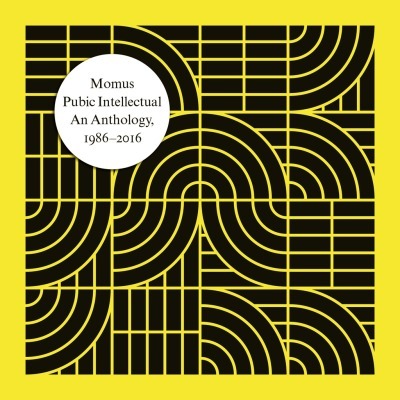 Released by Cherry Red in August 2016, Pubic Intellectual is a 3-CD, 30-year retrospective of the songs of Momus, chosen from his approximately thirty LPs by the artist himself, with a sleeve commissioned from his current designer, Hagen Verleger. A 16-page booklet contains sleevenotes written by Momus. Scenes like this give sadomasochism a bad name"
The tragedy is no-one's dying! He says "Tell me, Mrs Lincoln, did you enjoy the play?" "Cut it out Socrates, can't we just talk"
Every Good Boy Deserves Favour, where's mine? Do I look like Jack The Ripper? So many cliches have sentimental truth, don't you find? Here comes some new Brutus in black 501s, ha! And all the time I see you there in the eye of my mind, and all that cheap macho stuff about de Sade, misogyny, vanish in thin air and I'm moved to tears just like any other sucker who's been bruised by all the things that weren't to be, and yet who's ready to fall down on his knees in front of a woman and say "Whatever you may do, whatever you may be to me, despite the times we disagree, your ridiculous ambitions, your conventional inhibitions, I want you to know that I respect you, I accept you and I want you to accept me, I want to kiss you, kiss your stockinged knee, accept the uniquely soft flesh on the undersides of your hips"
And the men who say "No competition!" I'm jealous of the people who ask you to ask me "Who's keeping score?" Can't you feel how you're killing my pride? "I feel privileged you chose me to go straight with"
You who sniggered "look out for your arse"
Who brought me up according to a fantasy? Who brought you up according to a fantasy? Will be the death of me"
How did I pass my time an earth, what on earth got into me? How did I pass my time on earth, how did I bear witness? And how was I treated in this world and in this industry? In the lives of the likes of me! How Do You Find My Sister? So how do find my sister, Mister? So how do you find my sister, Minister? I buzz three times on the intercom and say "Lulu, it's your solicitor"
Ladies and gentlemen, Mr Henry Kissinger! "Kneel before me, kiss it, call me 'Sir!'" "Kneel before me, kiss it"
How do you find my sister, now? Just tell him I'm dying to meet him"
Here is the abyss: jump in! Il peut revoir encore l'image dans sa perfection"
If this love I feel must always be denied? Tell me when will I ever learn? Were we ever in them? And when I'm paralytic will you still be true? All things will be clear to us one day"
"We're prepared to make concessions"
Why deny that Pegasus has wings? Why deny the siren when it sings? I grow old! I grow old! Do I dare to walk the beach? But is the grave my sole reply? And is the grave my sole reply? May I make some observations? When I buried my steel in his belly? Was it because my hair is all gone? Why not learn to love your contradictions? Why not live your life to the full? Of the contradictory beauty of you! Of the power and the beauty of you! "Make fools of the fools, as one should"
Love me for my cooking! That's a bit more important than this? Where is the disabled loo? Do I have the right to use the disabled loos? Did they send the right man from the land of heroes? "I think I'd rather sleep with her with no clothes on than you in your best suit"
Chiku chiku, when will I see you again? They have labelled me "the ephebophobe"
Of all the cunts he's seen? You've lost your shape, you've lost your "you"
It seems you're dead, oh bloody hell!